Joi 31 martie @Moszkva #Oradea, ora 20! 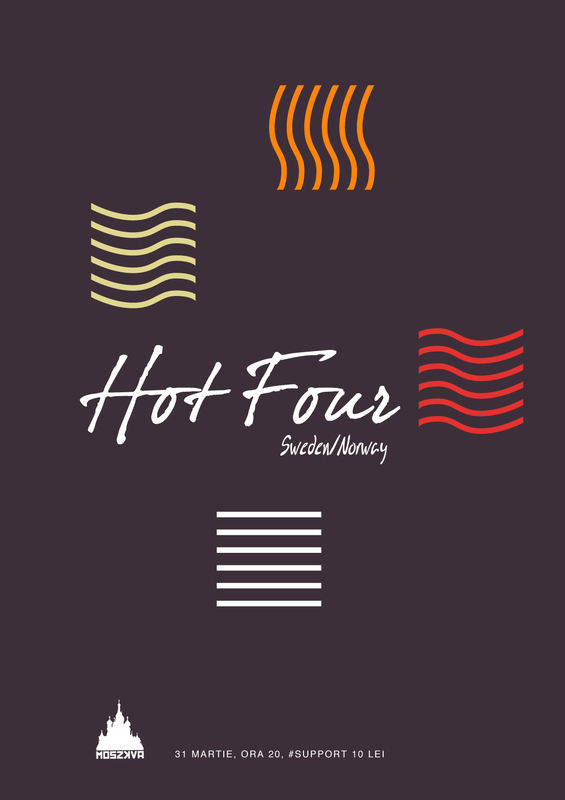 Hot Four plays open-minded improvised chamber music, focusing on musical textures, dynamic variations and timbre, influenced by European improv tradition, modern jazz and contemporary classical music. For some years, the musicians now also have been playing together in different projects, so forming the group seemed natural in many ways. As a group, Hot Four’s been touring and playing concerts since 2012, supported by Arts Council Norway (Norsk Kulturråd) and Norsk Jazzforum. Hot Four even played an hour live on Sveriges Radio P2, December 2013. The members of Hot Four has released a lot of different albums, and they’ve been touring and playing with various bands/musicians, such as LabField, SEVAL, Lina Nyberg Band, The New Songs, motsol, VCDC, Zas trio, Kitchen Orchestra, Andy’s Circus, Andreas Backer Trio, Björn Berg Borg, Ester & Andreas, Mats Gustafsson, Raymond Strid, Evan Parker, Barry Guy, Paul Lovens, John Russell, Axel Dörner, Sofia Jernberg, Sten Sandell, Michael Zerang, Fred Lonberg-Holm, Ken Vandermark, Paal Nilssen-Love, Jim O’Rourke, Han Bennink, Steve Beresford, Roger Turner, Frode Gjerstad, Per Zanussi, Nils Henrik Asheim, Henrik Olsson and many more. “Together the four dive, head on, into a thick, intense exploration of various dynamics, textures and timbres. The notion of playing music receives a new meaning with these highly resourceful musicians. They enjoy the innocent and often eccentric, unattached to any musical conventions. A game-like process of playing— finding and inventing sounds, shaping and mutating these sounds, collides these sounds without any preconceived ideas what might happen next, but react immediately to these sonic occurrences. Songs are performed with a rare collaborative and emphatic manner. There is a delicate balance between all four players on the first, title-piece, that embraces a gentle flow of wordless, stream-of-consciousness vocals by Backer. This interplay changes course to one that is more dense on “Antler of the Moose,” where they establish a nervous, rhythmic world of sound. Nothing is conventional, not human vocals or those produced using extended techniques on drum skins, cymbals, or guitar and double bass bodies and strings. Still, it all sounds organic, nuanced and surprisingly coherent. This inventive, collective improvisation rests and adapts a spare, strangely distant and quiet interplay on “Claw of the Moose,” before the quartet finishes the live set with another arresting, noisy outburst. “In spite of the bull moose on the cover artwork whose blood-red background and the dissection in four parts of the outline of the hugest member of deer family, it’s neither a leaflet for butchers nor a christmassy idea of gift, even if the debut release by this fourtet is much more interesting than the invasion of records from mainstream musicians that majors normally led in this period by means of marketing necromancers! The initiative got drawn up by talented Norwegian vocal artist Andreas Backer who grouped Stale Liavik Solberg, a brilliant drummer who was his mate at Stavanger music academy, Swedish guitarist David Stackenas – we already met his name and his skills on some collaborative releases with Ernesto and Guilherme Rodrigues – Canadian expat double bass player Joe Williamson together and recorded this amazing live session in Sweden, where they insert contemporary classical music, free-jazz and European improv hooks as well as a remarkable numer of sonic ideas in a blender that flushes amazing dynamics out. – Vito Camarretta, Chain D.L.K.